As a part of the International Film Festival Rotterdam 2012, this interactive installation took place at WORM, Rotterdam. 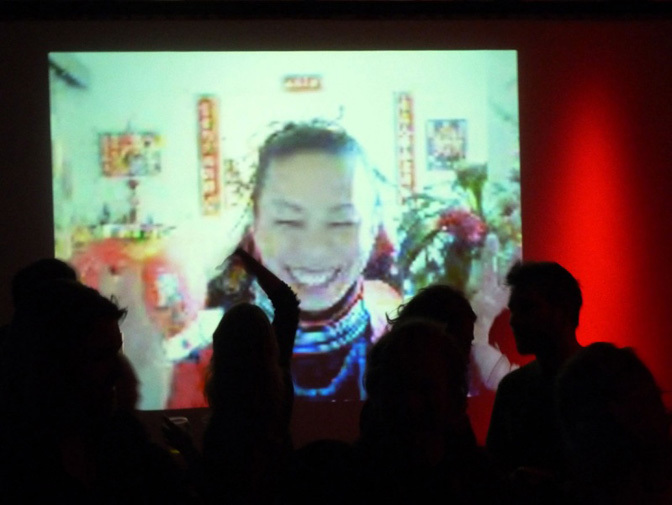 Streamed live via Skype from my mother’s living room in Sydney, Australia, she and I formed the TLANSATLANTIC OLACLE MUM act – a contemporary Chinese fortune-telling duo reminiscent of a circus show from the past. Divined in the twilight zone of the wheelchair elevator shaft, my mother calculated the lucky visitor's fate while I mediated the reading by translating her Chinese into English and sometimes re-interpreting information to better suit the person. Only allowing a few people per session, the small glass box was at once intimate and open. Furthermore, a public group fortune reading based on that night's average took place in the big hall upstairs.